A guacamole grilled cheese sandwich has been on my to try list for a while now and since I was making the bacon guacamole on the weekend I figured I would just pick up double the ingredients and make both. 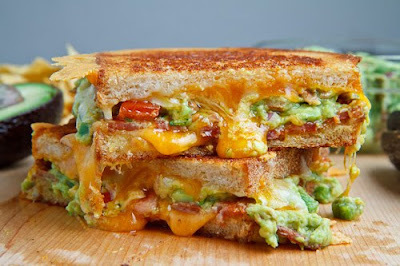 The basic idea behind this grilled cheese is quite simple and it started out with just adding guacamole to a grilled cheese but with the success of combining salty bacon-y magnificence with cool and creamy guacamole I could not resist adding a few slices of bacon to the sandwich. I also had some leftover corn tortilla chips from dipping on the weekend so I decided to crumble a few of them and add them to the sandwich for texture. 0 Response to "Bacon Guacamole Grilled Cheese Sandwich"